It has been said that there will come a time when it is not the inerrancy or the infallibility of the Bible that we question but its sufficiency. I dare say, if we have not arrived at that place, it seems the door is open and we are walking across the threshold. This morning I was feeding my grandson sweet potatoes. Plain puréed sweet potatoes. And he ate them. And he liked them. And they nourished his body. They are sufficient for him as they are, with no butter, brown sugar or marshmallows. His parents know exactly what I am putting into his little body. If sweet potatoes are so good, and so good for you, why do we embellish them? 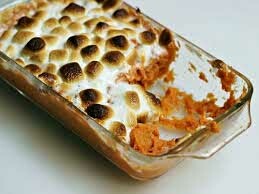 You know what I mean, we add cream, eggs, sugar and spices, then cover the top with marshmallows and call this new concoction “sweet potatoes” even though sweet potatoes are now only one of many ingredients. We would probably be more accurate if we called this new dish “sugar”. By calling it “sweet potatoes” no one really knows exactly what they are ingesting, nor can they trust the calorie count or how it will react with their body. We have turned a healthy item into an unhealthy one. Likewise, why do we add all kinds of things to the Word of God? Are we trying to hide it, soften it, or enhance it? For what purpose? Don’t we trust the sufficiency of the Word of God? It doesn’t look like we do. For example, a friend shared a version of the Ten Commandments with me recently, written by a very popular Bible study teacher. This wonderfully loving and newly written Ten Commandments sounded much like wedding vows, and since God is a covenant making, and covenant keeping God, I can understand why this person might write these. However, this embellished version bore such little resemblance to the actual Word of God that I’m not sure I would have recognized this as the Ten Commandments if I hadn’t been told what I was reading. There was, however, an implied equality with God. I think this is the thing that bothers me most about embellishments. When we re-write Scripture, as poetry, songs, or as Jesus-speaking devotionals, are we blurring the line between God and believer? Are we inadvertently presenting God as a peer? I think sometimes it is what we want, and I think it is because we want to feel good when we get up from our quiet time. We want to feel special. We want to feel like we just had coffee with our best friend, the one who never tells us our outfit makes us look fat, that our hairstyle dates us, or that it is not wise to flirt at work. Or do we prefer embellishments because we really don’t like the Word of God? Are we the reason for the marshmallows on the sweet potatoes? Are we too often offended, put in our place, or convicted when we read God’s Word? Do we chafe when we are reminded that God is God and we are not? Do we want to sugar-coat Scripture for those we lead because we are afraid that God’s Word will offend, divide, or turn them off to Christianity? Is that why we prefer to give them books that are filled with embellishment rather than the pure Word of God, the Bible? Seriously, do we think that newly enhanced creations will be more powerful than the actual Word of God? Do we think they have any authority to change lives? When God’s Word is enhanced, decorated and re-written so that God is no longer glorified in it and the majesty of the One True God is no more than a hidden ingredient, there is no authority, and no power. We must know the Scriptures in order to know when they are enhanced. We must read the Word of God, not just sweet books about it. We must study the Word, not just read what someone has rewritten in flowery, poetic images. But we don’t want that. That hurts. But can there be gain if there is no pain? Can there be growth if we are not stretched? Can there be deeper understanding if there is no challenge? Am I saying that we don’t need preaching or teaching or commentaries? No. We most assuredly need the Word of God to be expounded and elaborated on. We need to know context and explanations of original words. But we don’t need embellishment. Exposition enables understanding of original intent and meaning. Embellishment hides or distorts meaning. What are you reading when you spend time with God? His Word? Or an embellishment? How would you know? When we read God’s Word we will be challenged, sharpened, and will continue to ponder the majesty of God. An embellishment will lets us walk away from our quiet time affirmed in our self-focus. Are you growing in your understanding of the character and nature of God in the things you read? Are you encouraged to trust in the faithfulness and trustworthy Person of God? If you are spending time in His Word, you will be. Is God’s Word sufficient for you? Hmm, well said, Marcia! I agree all the way..sometimes we are led away by “positive ideas” that make us feel good and think we are meditating on His word..thank you for this important reminder to trust His unadulterated truths! Wow…powerful! Example of sweet potatoes so helpful. Makes me not only want to stay away from reading the marshmallow “fluff” but from giving out my own version of it. May we serve up His Word to reveal its inherent sweetness like you do for us! God bless you. You always give out God’s Word!